It is a great pity that David Malo, the Hawaiian Historian and Antiquarian, did not preserve in his “Moolelo Hawaii” or Hawaiian Antiquities, some account on Ancient Hawaiian Astronomy. S. M. Kamakau, a contemporary of David Malo, and also a writer on the Ancient History of Hawaii nei, is little better off, about this matter than his colleague. He wrote an article on “Instructions in Ancient Hawaiian Astronomy” and was published in the Nupepa Kuokoa of Aug. 5th, 1865. It was translated into English by Prof. W. D. Alexander for Maile Wreath (Lei Maile), and was republished by Mr. Thos. G. Thrum, in his “Hawaiian Annual” for 1890. In the year 1885, we found in the monthly newspaper, “Ka Hoku o ke Kai,” that subject was treated again, only to last a very short time. And about twelve or thirteen years ago we again found certain very valuable statements pertaining to the Ancient History of Hawaii by Kanalu, said to be the priestly ancestor of the priesthood or order of Kanalu. We saw in “The Journal of the Polynesian Society,” Vol. XVI, No. 2, an article on “Tahitian Astronomy” by Miss Teuira Henry. It treats the “Birth of the Heavenly Bodies.” It is very interesting. 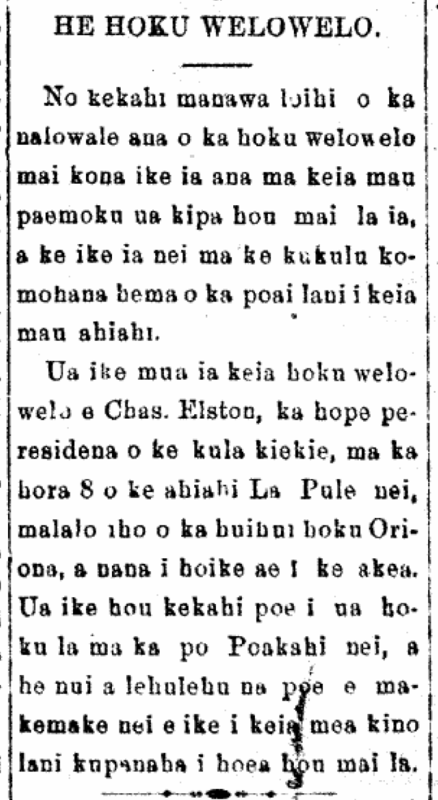 In order to preserve these accounts relating to Hawaiian Astronomy, we give our English translation here, starting first from the account in Ka Hoku o ke Kai (1885). In ancient times, the class of people studying the positions of the moon, the rising and setting of certain fixed stars and constellations, and also of the sun, are called the kilo-hoku or astrologers. Their observations of these heavenly bodies might well be called the study of astronomy. The use of astrology anciently, was to predict certain events of fortunes and misfortunes, victory or defeat of a battle, death of king or queen, or any high chief; it also foretells of pestilence, famine, fine or stormy weather and so forth. The old Hawaiians knew some names of certain planets and several constellations. The names of planets are somewhat slightly different in corresponding English names, rendered by Andrews, Alexander and the late Dr. Bishop. HAW. NAMES OF PLANETS ANDREWS. ALEXANDER. BISHOP. The Hawaiian name for Mars according to Prof. Alexander is Hokuula (red star). 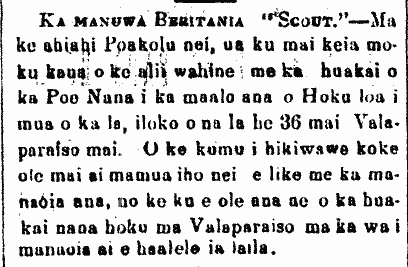 In the newspaper “Ka Hoku o ka Pakipika,” published about the year 1860, the name for the planet Saturn was Makalii, Kauopae for Jupiter and Polowehilani for Mars. Kuokoa Home Rula, Buke VII, Helu 14, Aoao 2. Aperila 2, 1909. After a long period of being gone from these islands, a comet [hoku welowelo] came back, and it can be seen in the south-western side of the skies this coming evenings. This comet was first spotted by Charles Elston, the vice-president of the high school, at 8 in the evening of this past Sunday, under the Orion constellation, and it was he that announced it to the public. That star was seen again by other on the night of this Monday, and there are great number of people who want to see this awesome heavenly body which has reappeared. Ke Aloha Aina, Buke VII, Helu 20, Aoao 6. Mei 18, 1901. METEOR SEEN FALLING OUTSIDE OF OAHU NEI. 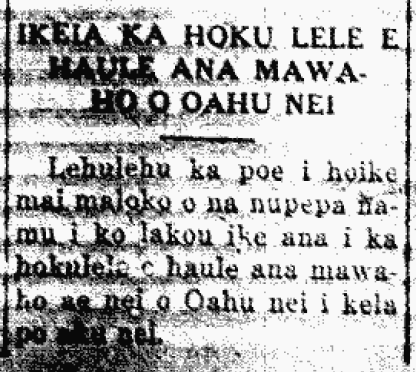 There were many people who reported in the English-language newspapers that they witnessed a meteor [hoku lele] falling outside of Oahu last night [Wednesday, 7/25/1934]. Ke Alakai o Hawaii, Buke 7, Helu 13, Aoao 4. Iulai 26, 1934.